(The Pavement, 10 December 2011) Last month The Pavement ran its first advert warning of the dangers of sleeping in bins (pictured). But how widespread is this issue and what is being done to discourage it? We asked Biffa, one of the UK’s leading waste management companies, if this is something they’re aware of and, if so, do they have any records to indicate the scale of the problem? Sadly, over the years, The Pavement has learned of and reported on much more severe, and sometimes fatal, cases. Just last month, two homeless men who were sleeping in a bin in San Antonio, Texas, were accidentally dumped into a waste truck compacter. According to KSAT news, one of the pair, Richard Salinas, managed to escape and raise the alarm but it was too late for the other man trapped inside, who was crushed from the waist down and later died. In a bid to avoid tragedies such as this, Biffa has implemented a series of “pre-lift” procedures, designed to make sure no one in sleeping inside a bin before it is lifted and tipped into the waste truck. As well as visually checking that no one is in the bin, the bin is rattled once the lifting forks are in position to give anyone inside another opportunity to make themselves known. The trucks are also fitted with cameras, which film the rubbish material as it is tipped into the truck and relay the images back to the cab, giving staff another opportunity to spot a body. Another step Biffa is currently taking is to introduce a “near miss” reporting programme. “We are looking at actually identifying how many people we think might have been in a bin prior to us lifting it,” explains Mr Davis. “And also when we actually do move it, if anybody is found to be in that bin, making sure that our people report that internally as a near miss because that’s a potential accident – it might have been stopped at that time but we still need to know why.” Under the new scheme, staff will be able to call the Biffa call centre to notify the safety team immediately. Biffa, like other waste management companies, has also introduced lockable tops and warning stickers on bins, although how effective such stickers are is unclear. The bin slept in by the two men in San Antonio had warning stickers on, and warning stickers were introduced in Brighton long before the death of teacher Scott Williams, who was crushed in a rubbish lorry after falling asleep in an industrial bin. 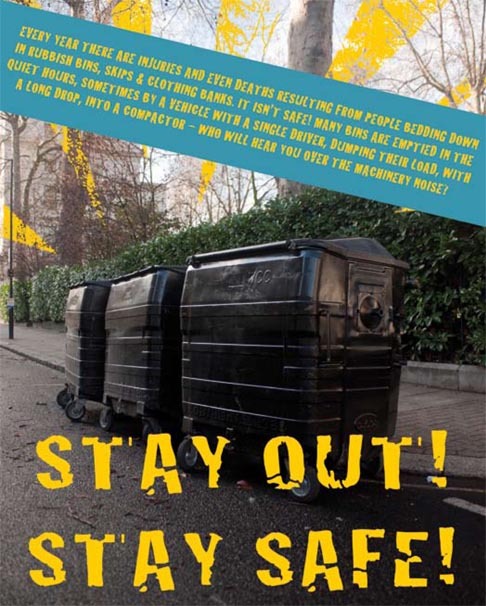 Following that accident, in July 2009, City Clean “upgraded” its warning stickers on large bins and worked with the council’s homeless team to put up posters in hostels and other buildings visited by rough sleepers to warn them of the danger of sleeping in bins.